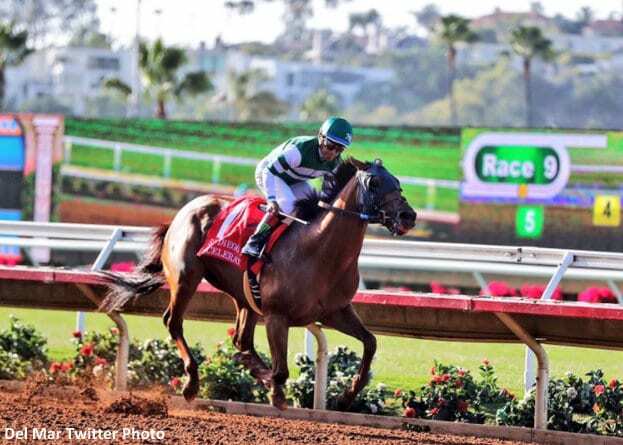 In a huge upset performance, Hronis Racing's Accelerate dominated Saturday evening's G2 San Diego Handicap by 8 1/4 lengths, ending the seven-race win streak of World's Best Racehorse Arrogate. That streak includes the Breeders' Cup Classic, Pegasus World Cup and Dubai World Cup, and while the San Diego looked like an easy win for the colt on paper, it was not to be. Accelerate, however, brought his game face to lead the field from start-to-finish under Victor Espinoza, completing the 1 1/16 miles over Del Mar's fast main track in 1:42.15. 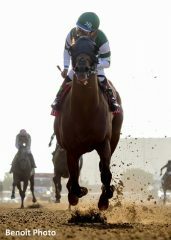 Trained by John Sadler, the 4-year-old son of Lookin At Lucky recorded the second graded stakes victory of his career. Donworth and Cat Burglar ran second and third, respectively, while Arrogate finished off the board for the first time in his career in fourth, 15 1/4 lengths behind the winner. The champ appeared wired up in the post parade, dancing about next to the lead pony as Smith stroked his neck trying to soothe him. Though Arrogate appeared to break with the field, he did not step into the bridle as per his usual style. Immediately to his left, El Huerfano went to his knees at the start, tossing jockey Evin Roman onto his neck. Though El Huerfano recovered, regaining his feet to gallop on with the field, Roman was unable to regain his stirrups and was out of control for the entirety of the race. Accelerate, meanwhile, had a very sharp start from the rail position and managed to sidestep to avoid tangling with El Huerfano, then went straight to the lead. He took up a one-length advantage over Donworth, and Cat Burglar was moving comfortably in third. Arrogate settled into a rhythm on a long rein at the rear of the field, while Roman tried to wrestle El Huerfano toward the outside rail to pull him up. After several failed attempts to regain his stirrups, Roman appeared to have lost complete control of El Huerfano as the horse ranged up to be just alongside Accelerate on the front end. Approaching the far turn, El Huerfano finally appeared to tire of fighting his rider, and allowed himself to be eased. Meanwhile, Arrogate was about six lengths off the pace of Accelerate, who set fractions of :23.49, :47.00 and 1:11.39 with almost no pressure. Donworth was the first to challenge him, coming within a half-length of the lead, but around the far turn Accelerate just exploded away from the field. While Smith was busy scrubbing away on Arrogate at the rear of the field, trying to get some reaction from the big gray colt, Accelerate turned for home with nearly a five-length lead. Espinoza simply rode him out to the wire, crossing it 8 3/4 lengths ahead of Donworth. Cat Burglar came in third, and Arrogate was off the board for the first time in his career, beaten 15 1/4 lengths. Accelerate also finished ahead of Arrogate on the latter's debut last April at Los Alamitos. In a maiden special weight contest, Accelerate finished second while Arrogate was a troubled third, the future star beaten just three-quarters of a length for everything. 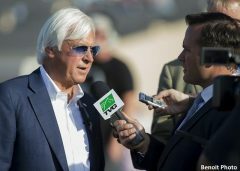 “It happens, and that's why I have white hair,” Baffert joked. He added that if Arrogate checks out physically, he will definitely still run in the Pacific Classic. Bred in Kentucky by Mike Abraham, Accelerate was a $380,000 Keeneland September Yearling Sale purchase. He broke his maiden in his fourth career start, also at Del Mar, and won his first graded stake in the G2 Los Alamitos Derby. Accelerate had struggled to find the winner's circle since that victory, but never ran worse than third. Overall, Accelerate has won four of his 12 starts for earnings of over $600,000. From a show pool of $1,402,055, Arrogate was bet for a total of $1,320,483. This “show plunge,” as it is known, caused record payoffs on Donworth in the place and show categories at Del Mar. Prices were as follows: Accelerate paid $17.60 to win, $32.60 to place, and $22.00 to show; Donworth paid $119.80 to place, and $67.40 to show; and Cat Burglar paid $38.20 to show. Donworth's payouts eclipse the standards set previously by Cipria in 1955 of $101.60 to place and $40.20 to show. This entry was posted in NL Article, Racing and tagged accelerate, arrogate, Bob Baffert, cat burglar, Del Mar, del mar thoroughbred club, donworth, hronis racing, john sadler, Keeneland September, mike smith, san diego, San Diego Handicap, unbridled's song by Paulick Report Staff. Bookmark the permalink.